Faculty David Baker, physics, and Michael Fairley, communication, led 20 students in hiking, kayaking, volunteering, and standing in awe during the course “Iceland: Fire and Ice of the Vikings” this May. Nature itself was the classroom as the group experienced the volcanic and glacial processes that shape the dramatic landscape. 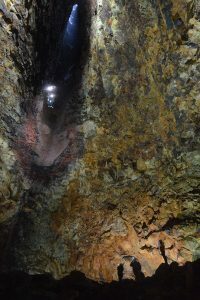 Pictured here, students and faculty entered a small volcanic vent to descend 340 feet INSIDE a dormant volcano—via a platform regularly used for window cleaning. 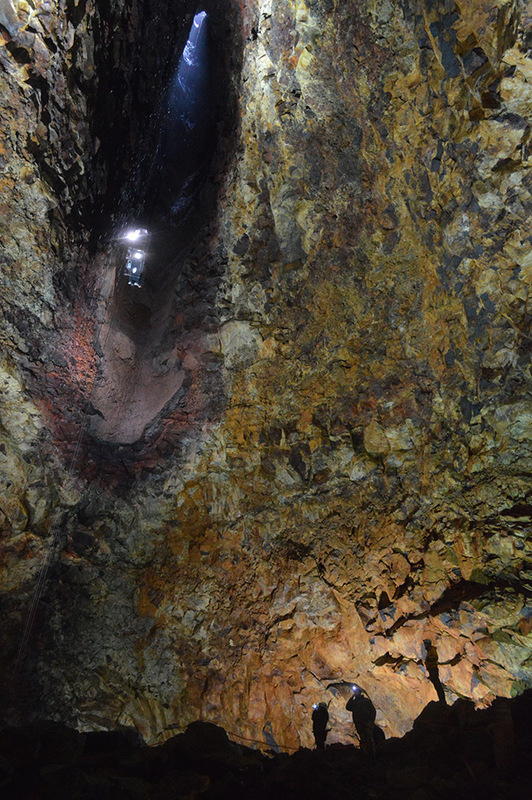 The chamber is one of the only places in the world people can be inside a volcano. The trip also included, among other things, a farm stay, a visit to the Icelandic capital of Reykjavik during its famous Arts Festival, and environmental volunteer projects in which students planted more than 700 birch saplings in a barren area that was once densely forested. Almost all the forests have disappeared due to cutting for firewood and agriculture. Without vegetation to trap the soil, erosion by wind and water has devastated many regions. The group also volunteered in the small eco-village, Solheimar, where environmental sustainability is a main focus. The trip is considered a January Term (in May); the brutally cold temperatures of the region in January made May a better travel option. David Aiello, biology, led a May course to Trinidad and Tobago that included study of Leatherback Sea Turtles and other species. Jessica Healy was a co-instructor on the trip.